The formal dining room of this new colonial house at 48 Clinton Avenue has a tray ceiling and wainscoting on the lower walls. WESTPORT — The look of the neighborhood in Westport that includes Clinton Avenue is gradually changing. One by one smaller houses that once dotted the streetscape are being razed and replaced with larger domiciles that more accurately reflect and accommodate the lifestyle of today’s families. The ranch house that stood on the 0.32 of an acre mostly level property at 48 Clinton Ave. at the corner of Fillow Street was torn down in recent years and in its place now stands a light tan-colored shingle-style colonial house that has almost as many bedrooms as the ranch had rooms in total. The ranch had five rooms. This new house, built in 2015 by EPL Enterprises in Monroe, has four bedrooms. The ranch, which was built in 1960, had only 1,363 square feet of living space while this new house has more than that in the finished basement alone. In all, the new house has a total of 7,631 square feet on four finished floors including 1,631 just in the basement. Although the appearance of the street and the size of the houses are changing, the one thing that remains the same is the sense of community. Houses are closer together in this neighborhood and neighbors really get to know each other in this family-friendly place. Another benefit of the location is its proximity to all the town has to offer. For commuters, the Merritt Parkway is not quite a mile away. Route 136 (Compo Road North) is at the beginning of Clinton Avenue for easy commutability to downtown Westport shops, restaurants, town offices, the public library, and Westport Country Playhouse, all just about a mile and a half away. Compo Beach, Sherwood Island State Park, Longshore sports complex, and the Saugatuck train station are just another two miles farther away but still easily accessible. In the front of the house stone walls and attractive landscaping line the path to the covered front porch and entrance. This front door, and another on the side entrance have a decorative combination of leaded, beveled and fern glass. Inside, the two-story foyer is flooded with natural light through the large second story, multi-paned window that sits above the front door. The house enjoys a spacious open floor plan from one room to the next. The generously-sized formal living room has a coffered ceiling. Across the foyer is an office. 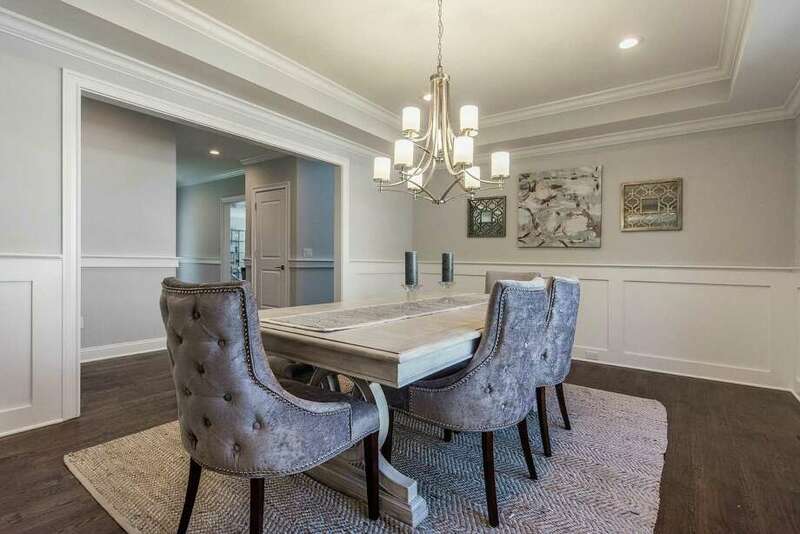 The formal dining room has a tray ceiling and wainscoting on the lower walls. Features in the gourmet kitchen include a Wolf six-burner range and pot filler, a large center island, counters and the island topped in Carrera marble, a huge walk-in pantry, and a breakfast nook with a door to the bluestone patio in the level backyard. The family room has a fireplace and doors to the same patio. On the second floor, the landing has a homework or study area. The sizable and attractive master suite has a vaulted ceiling with a coffered affect at the top. Its fireplace has a marble tile surround arranged in a herringbone pattern while the marble floor of the cavernous yet intimate master bath is in a basket-weave pattern. The master also has a walk-in custom closet. There are three other bedrooms on this floor, one is en suite and the other two have full baths just outside their doors, which can be accessed in the hallway. The third floor has a large bonus room with a half bath and a window seat; great for playroom or guest suite. On the lower level there is wall-to-wall carpeting, a fireplace, half bath, mudroom area, and access to the two-car attached under house garage. There is a room that has flexible use as a play or game area, a second room that is intended for yoga or exercise. There will be an open house on Sunday (Jan. 15), 1-4 pm. For more information or to make an appointment to see this house, contact Kim Vartuli of The Vanderblue Team/Higgins Group Real Estate at 203-258-3797 or kimv@vanderblue.com.